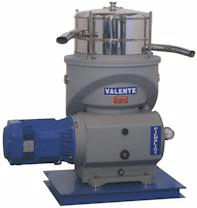 You can buy hobby milling equipment and commercial milling equipment at The Olive Oil Source Wholesale Store. 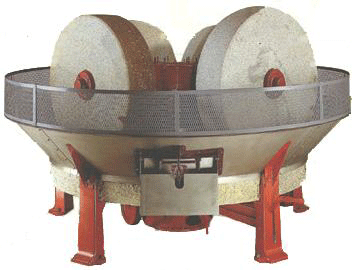 The two main types of crushers are stone mills and hammermills. There are also metal tooth grinders, although these are much less common. One of the most common myths about making olive oil is that stone mills are superior to hammermills and other metal crushers. This notion must be based on the romantic idea that old-fashioned methods are better. This is not the case. Different equipment have different pros and cons, as you will see below, but the notion that stone mills are superior is mainly a marketing twist to sell olive oil. Stone rollers or wheels roll in circles on a slab of granite to grind the olives into a paste. They are sold in different configurations, with two, three, or even four stones. The stones do not cut the olive skin, so less chlorophyll is released. Larger size drops of oil are formed, which minimizes mixing times. The paste is not heated. A lower level of polyphenols is extracted so the oil is less bitter. The stones are difficult to clean. Green olives prolong grinding time. The process is discontinuous, hence time-consuming. The labor costs are high. A hammermill has swinging arms that push the olives into the sides of a rotating chamber through centrifugal action, similar to a home garbage disposer. The mill may have one to several hammers. The process is continuous with a high throughput. Cleaning is easier than stone mills. They tolerate debris such as rocks and grit better than stone mills. It is a well-known, perfected technology. More polyphenols are extracted so the oil has a longer shelf life. They may create an emulsion that impedes the separation between the oil and water, especially with very ripe, over-watered fruit. More polyphenols are extracted so the oil is bitterer than oil extracted with stone mills. This may be an advantage with mild olives or with olives with naturally low levels of polyphenols, such as Arbequina. There is some wear and tear of the metal parts. The paste may heat up. Pieralsi double-hammer/double-grid mill setups allow a decrease in the bitterness sometimes found when using traditional hammermills. The mill rotates much more slowly than traditional hammermills and the size of the grids can be changed to optimize the crushing process based on the characteristics of the olives. The olive skin is not pulverized as in other hammermills but torn open, in a way that is more similar to stone mills. We include these for the sake of completeness, although they are much less common than hammermills. The olives are fed into the center of the grinder. An electric motor attached to a toothed grinder pulverizes the olives as they are flung away from the center. They are less expensive than other equipment. They may give the oil a longer shelf life than stone mills. The olive paste fragment size is not easily modified. They may create an emulsion that impedes the separation between the oil and water. More polyphenols may be extracted, so the oil may be bitterer than oil made with stone mills. This may be an advantage with mild olives. One stone alone can break an expensive tooth on the grinder. The oil paste may heat up. This is a fairly uncommon practice. Some studies show that destoning lowers olive oil yields by less than 1.5%. Gas chromatographic comparisons of oil made either way show that stones do not make any distinctive contribution to the flavor of the oil, since they are made of primarily lignin and other woody compounds. There is some debate on the usefulness of this technique. Destoned olives are easier on the equipment. Oils are subjected to less heating due to stone fracturing. Destoned pomace is easier to use as animal feed. The stones can be burned to create heat to dry a watery pomace for easier disposal. The polyphenol level may be slightly higher, so the shelf life may be longer. The acidity may be slightly lower. The peroxide levels may be slightly lower. There is more chance of an emulsion forming which impedes the separation between the oil and water. The paste requires longer mixing times, thereby increasing oxidation. Destoning requires special machinery at additional expense. The oil yield is slightly lower. The polyphenol level may be slightly higher, so the oil would be bitterer. Again, this could be an advantage. Most malaxers are made of a horizontal trough with spiral mixing blades, although some have vertical troughs. The vertical ones are generally known to produce a lower yield. Some are covered, and inert gases can thus be used to decrease oxidation. A longer malaxing time increases the oil yield and helps the oil pick up minor components of the olives that can improve flavor. But a longer malaxing time allows oxidation that decreases shelf life; the oil has a higher acidity and peroxide level. Heating the olive paste will decrease viscosity and improve the separation of oil and water. This increases the yield. Heating speeds oxidation and enzymatic breakdown of the paste, however, resulting in a lower quality product with higher acidity and peroxides. The oil has a shorter shelf life. 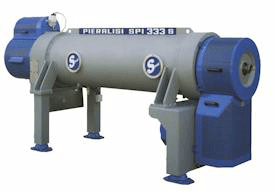 To discourage oxidation, mixing tanks such as the Pieralisi "Genius" system can now be ordered with covers that contain an inert gas such as CO2 or Nitrogen, allowing increased yield and flavor without the danger of oxidation. Mixing chambers kept under a vacuum will accomplish the same purpose, but cannot remove as much oxygen as an inert gas blanket. Water can also be added to facilitate the oil extraction but also results in lower quality oil with higher acidity and lower polyphenol level, hence a shorter shelf life. The next step is to separate the oil from the water and the paste. This can be done (or was historically done) in the many ways described below. Most systems fall into two main categories: presses and centrifugation. Nowadays, centrifuges are used almost exclusively, aside from old operations. Historically, olive paste was put on round mats or in burlap bags, stacked, and squeezed with a long lever weighted with stones, or via a twisting screw. 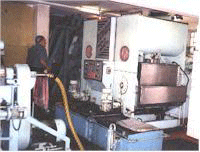 These presses were bulky and inefficient, since the pressure was low and the process discontinuous. In addition, the mats or bags were nearly impossible to clean. The olive paste in this photo was being squeezed in "sacceto" bags. Because it was not possible to extract all the oil in the “first press”, hot water was added to the pomace to help release additional oil, and a second press (or several) was done, hence the terms first press and cold press which are now pretty much obsolete, even though still widely used improperly for marketing reasons. This is somewhat similar to a hydraulic car jack: a piston squeezes the paste that has been applied to stacks of disk-like filters. 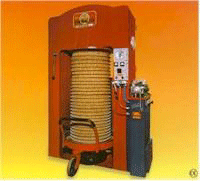 It is simple and reliable machinery. The energy consumption is low. The resulting pomace has a low moisture content. It tolerates rocks and sand without wear. No water has to be added and there is minimal vegetable water disposal. It is very labor intensive. Decomposition of materials left on mats, if not properly cleaned and stored, can produce chemicals responsible for winey and fusty defects. It is a discontinuous process. There is more exposure to oxygen resulting in more oxidation and a higher level of peroxides. The shelf life of the oil is shorter. These days, modern facilities all use a centrifuge-based system of extraction, also referred to as horizontal decanters. The traditional centrifuges (still commonly used) are three-phase: they spin the olive paste in a horizontal drum; the heavier flesh and pits go to the outside and the water and oil are tapped off separately from the center. The machinery is compact - one decanter can take the place of several presses. They are semi-continuous and automated. The amount of labor required is limited. There is no need for an oil/water separation step. More technical labor is required. They may consume hot water. The pomace may end up moist. As water has to be added to the process, a greater amount of vegetable water has to be disposed of. There is a loss of polyphenols due to the added water. They are subject to wear from rocks, sand, and grit. These are similar to the centrifugal decanter described above, but some of the vegetable water is recycled to extract more from the pomace. The water, oil, and pomace are simultaneously removed in a single step. This is the most modern machinery available at this time. They have the highest percentage of oil extraction. Less or no water needs to be added. The oil has more polyphenols and a longer shelf life. The vegetable water disposal is less of a problem. Olive oil from two-phase centrifugation systems contains more phenols, tocopherols, trans-2-hexenal and total aroma compounds and is more resistant to oxidation than oil from three-phase ones and from hydraulic presses. They are subject to wear from rocks, sand and grit. The oil has more polyphenols so will be bitterer. There are different advantages and disadvantages to two-phase vs. three-phase systems, in particular in terms of waste disposal. Rows of metal discs or plates are dipped into the paste; the oil preferentially wets and sticks to the metal and is removed with scrapers in a continuous process. This is not very commonly used and sale of future machines is currently outlawed in the European Union due to the difficulty of cleaning such large surface areas. The polyphenol content of the oil is higher. It is a low temperature method. The labor requirement to operate the machine is low. It often must be combined with one of the above methods to maximize oil extraction; this, of course, requires more space, labor, and expense. The large surface area can lead to rapid oxidation. This is the final step. Depending on what equipment was used in the extraction process, this may be unnecessary. When a hydraulic press is used and the liquid output is a mix of oil and water, with microscopic bits of olives, this final separation of oil from water is obviously required. In the case of separation with a centrifuge, when the product is almost completely oil, this step can still be beneficial (especially in the case of very ripe, overwatered olives when the oil has not separated perfectly in the first centrifugation), but it is not always an absolute necessity. The oil and water are put into tanks where they separate by gravity. This method is not used in any modern facility. It is inexpensive from an equipment point of view but very time-consuming, bulky, and leads to wasted oil if the separation is incomplete. It can also lead to a deterioration of the oil. Purifier: they take a little water out from mostly oil. This is the most common case. Skimmer: they take a little oil from a lot of water (if the goal is to scavenge the wastewater). Clarifier: removes a little solid from a liquid phase (removes microscopic particles from the oil). It is a quick step. It is very efficient and results in higher yield than gravity separation. They can be complicated to operate and difficult to clean, although the newer Pieralisi decanters with their self-flushing system, are much easier to use than other equipment. We have summarized the key advantages and disadvantages of the main methods in the table below.